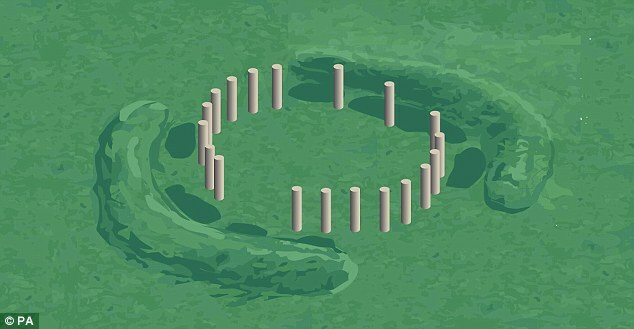 Magnetometric imaging has shown an, as-yet unexcavated, wooden circle, or “henge” less than 1000 yards away from Stonehenge. It has the same orientation as the more famous site: north-east to south-west. 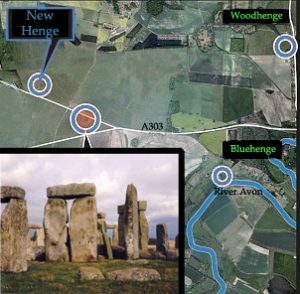 This finding only further augments last year’s discovery of “Bluehenge”, which is located on the Avon River one mile from Stonehenge. In 2006, there was a further announcement of discoveries in a neighboring area of Durrington where the foundations of houses were found for these ancient peoples. We appear to be seeing the emergence of a network of similar henges within close proximity of each other, probably used historically by the early humans inhabiting ancient Brittania dating around 2500-3000 BC. Clearly more than mere primitives, this land of the ancient peoples may have part of a ‘Brit’ or what could be called a covenant society who wanted to remain connected with sophisticated astronomic observations in the heavens. Have you ever wondered why neolithic Man expended a vast number of man-hours working on these structures (an estimated 20 million on Stonehenge alone) solely to calculate the dates of the summer and winter solstices, or whether there is an even more sophisticated intent designed into their building? Perhaps it was more than simply a calendar – because this area contemporarily marks the most abundant region for crop circles on planet earth, or what could be called the “round numbers”. Although this area is not the only place where stone circles and crop circles are found – they are clearly more extensive in this area than any other known place in the world. The Book of Knowledge: The Keys of Enoch® (Key 215) describes Stonehenge as “part of the greater astrophysical geometry,” as well as one of the key areasfor understanding the history of our planet. Subsequently, the new finding confirms this special area as one of the key locations throughout the globe where previously unknown artifacts and evidences of earlier life are changing our understanding of cultural history and the ascent of intelligent life. With this we are taking one step further into opening a path of new understanding within our own expanse of evolution.